Yesterday our cat Ollie caught a sparrow. I turned around from finishing making our bed to see a helpless little bird trying desperately to escape Ollie’s mouth. He managed it and flew into our lounge, Ollie and I both chased him in there. Ollie was thrilled of course and I was envisioning scenes of blood shed and a little gravestone on our back lawn. “Good boy, Ollie,” I crooned as I wrangled him off the poor creature. I shoved him unceremoniously into our bedroom and shut the door. Creeping quietly back into the lounge, I tiptoed over to where I thought the sparrow would be lying dead and massacred. Yipeee, I opened the windows, doors and any other opening I could find, before using my best scare tactics to get the poor creature out. Eventually, with a flutter of ruffled feathers he departed – leaving only a small pile of feathers in the hall. I let the meowing Ollie out of the bedroom. He sniffed the feathers, ran around the house and scratched the furniture when he realised the bird was gone. I sighed with relief and headed to the kitchen, where I could use food as therapy to recover from my cat’s animal instincts. Our culinary journey, takes us back to Vietnam today. Rice is the second biggest export and industry in Vietnam to Rubber. Driving through the countryside, you can see hard working people bending over pulling out the rice plants, in the hot sun. 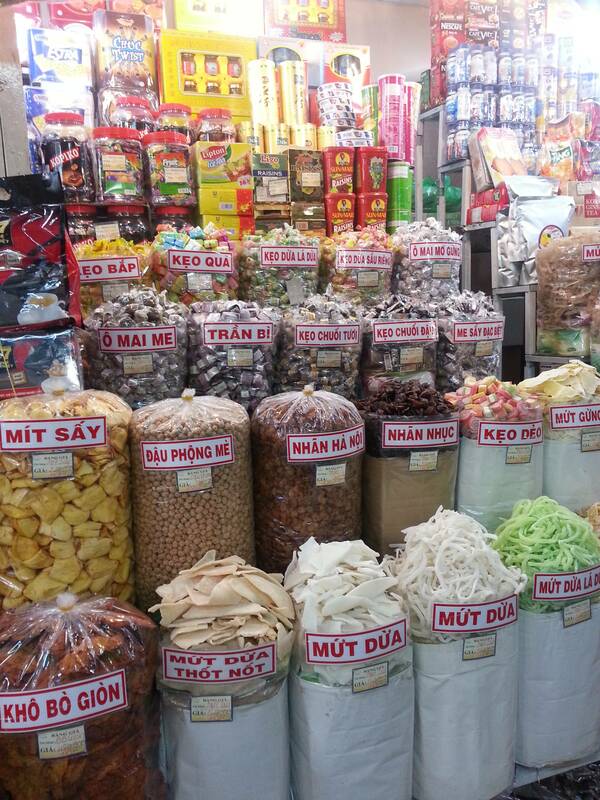 Today I will be re-creating Vietnamese Fresh Spring Rolls, by adding a dessert twist. These make a fun, quick and healthy dessert. 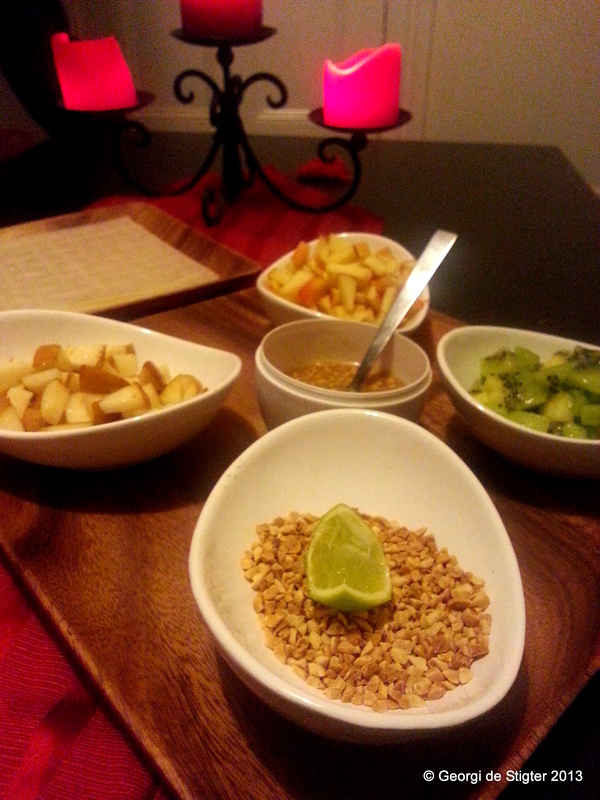 Chop the apples, pears and kiwifruit into small pieces. Then transfer to individual serving bowls. In a small bowl, mix together the peanut butter, maple syrup and lime juice. Taste and if too sweet add more peanut butter or if too sugary add more peanut butter or lime juice. Chop the peanuts roughly (or even faster – buy a bag of chopped nuts) and place in a serving bowl. Dip a sheet of rice paper in the bowl for no more than a few seconds, then place on a plate and add your filling (apple, pear, peanuts and kiwifruit). This should be added close to one of the sides. 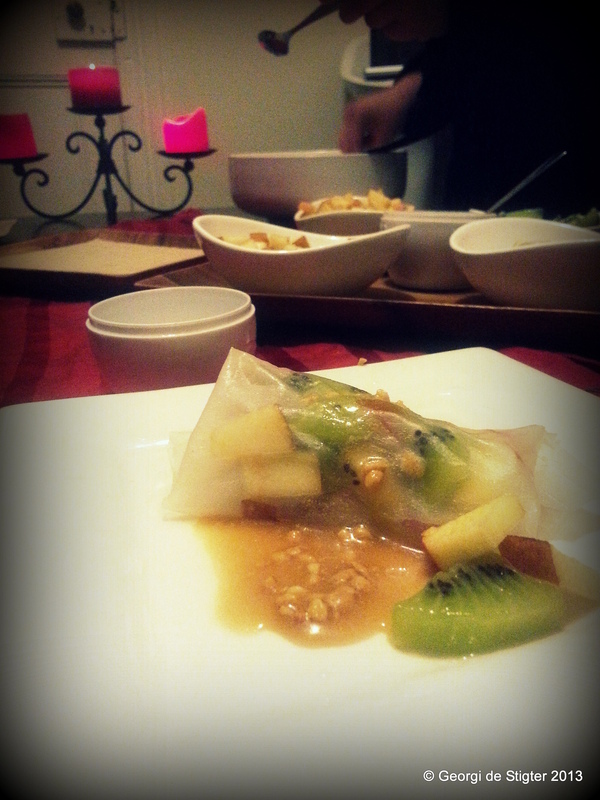 Then fold the two ends of the rice paper over the filling and roll as if it was a pancake. Serve drizzled with the peanut butter sauce and one of our friends enjoyed his with a light pale ale (beer), another specialty of Vietnam. Tune in tomorrow for a trip to Thailand!